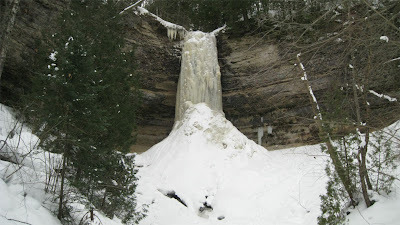 It is tradition for me to visit Munising Falls whenever I’m near the western end of Pictured Rocks National Lakeshore. Even in summer, when not much more than an unenthusiastic trickle of water drools from the top, I still must see it. For me, most of the attraction is the sandstone formation that the water falls from. 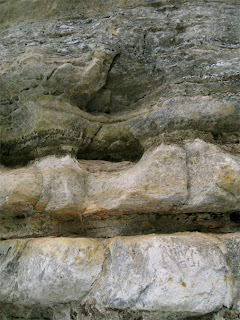 I am fascinated by the eroded cliff formations and canyons that were formed in the region when it was covered by glaciers. Here, Munising Creek drops 50 feet into the canyon below on its way to Lake Superior, a short distance away. I could spend hours examining the layered walls of rock that surround me while walking the short path from the interpretive center to the waterfall. I am mystified by the people I have seen walk briskly toward the sound of splattering water, never once look from side to side, stop for a moment at the first viewing spot, snap a photo and turn around. I lose sleep over this kind of thing; it is the curse of the obsessive rock nerd. Barriers have been put in place fairly recently in an attempt to stop visitors from walking under the cliff and behind the waterfall. Signs posted warning of the potential danger of falling rock lend justification to these measures, and in warmer months it is not unusual to see a park ranger keeping a casual eye on potential adventurers. 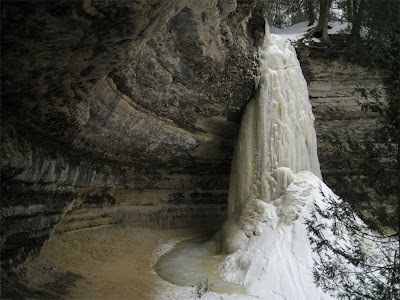 During winter, Munising Falls creates a different, possibly even more spectacular scene. 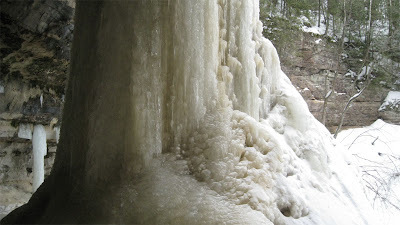 A massive column of ice is created, giving the falls a much bigger presence. Unfortunately, lack of funding does not allow the interpretive center to remain open through the winter months, but the smaller number of visitors allows more freedom to explore and photograph the area without having to wait for people to get out of your frames. You are also less likely to get caught climbing over the barricades. Normally, I obey the rules about this kind of thing. I respect the desire to keep natural areas untouched and keep erosion to a minimum, but it is really hard to resist getting closer to that column of ice. 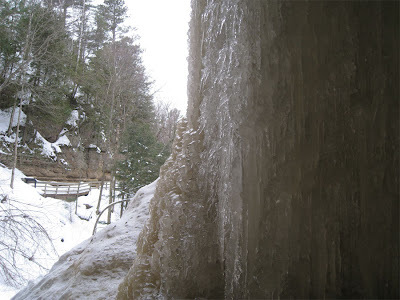 I speculate that when rules are broken and the ice is observed directly, the sound of running water can still be heard from within the frozen waterfall. I imagine that the trickling echo could lead someone to look down past the base of the ice to see the stream of water rush out to continue its journey. I can’t say for sure, though, and I have no idea where these photos came from. The North Country Trail (also called the Lakeshore Trail along this stretch of Michigan’s Upper Peninsula) can be accessed directly behind the interpretive center. 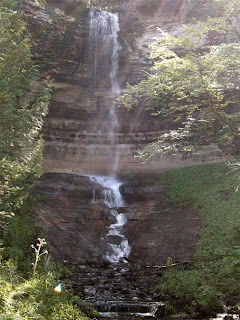 For backpackers through-hiking the NCT - a 4600-mile footpath running from North Dakota to New York - Munising Falls would be a nice rest stop. It is also either the starting or ending point for those hiking the 42-mile Pictured Rocks National Lakeshore section only. This route is a one-way trip from Munising to Grand Marais (or the other way around) and features some of the most awe-inspiring scenery of the entire multi-state trail. I am considering this option for a fall backpacking trip later this year. Very nice. Being in Alabama I don't get to see all the cool stuff that a deep winter creates. One day I shall have to venture up North for some time.